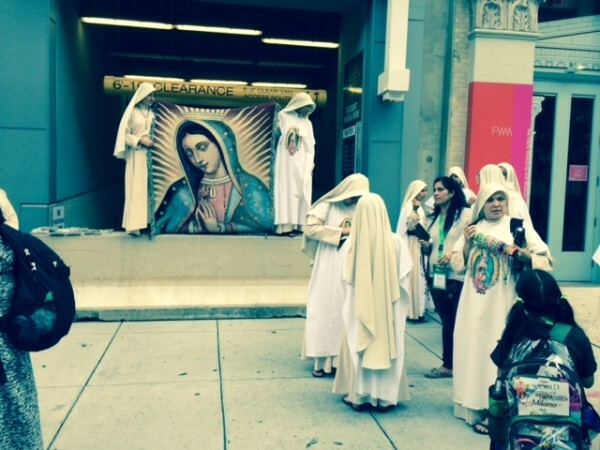 Nuns along Arch Avenue last week in Philadelphia with a banner of the Virgin of Guadalupe. In Philadelphia, the city welcomed Pope Francis with both religious fervor and commercial acumen. His visit closed out the World Meeting of Families, which attracted Catholics from dozens of countries for a week-long gathering stressing Catholic teaching and social justice. As volunteers answered questions and helped thousands find their way, enterprising vendors sold bobbleheaded pope dolls, Vatican flags, T-shirts, baseball caps, commemorative coins and yellow lanyards with the pontiff’s visage. Photo by Cecile S. Holmes, longtime religion journalist and director of the journalism sequence at the University of South Carolina’s School of Journalism and Mass Communications.